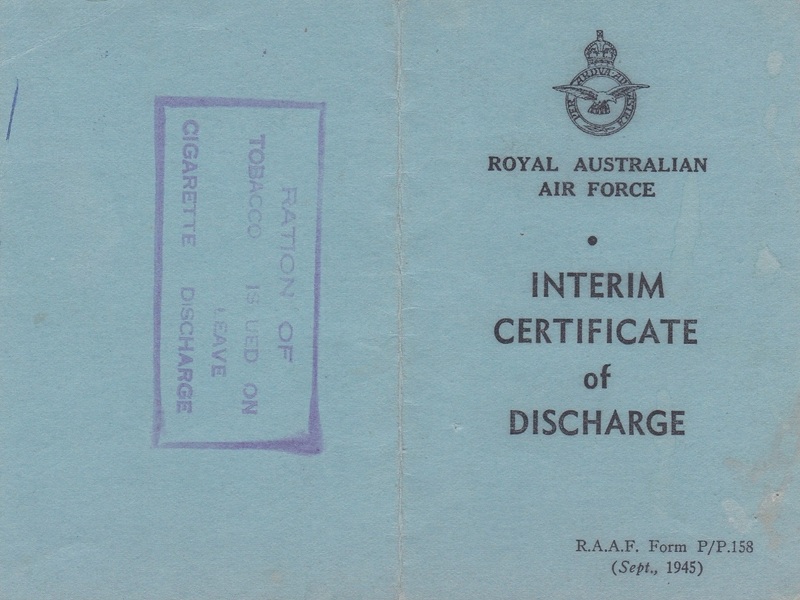 D845. 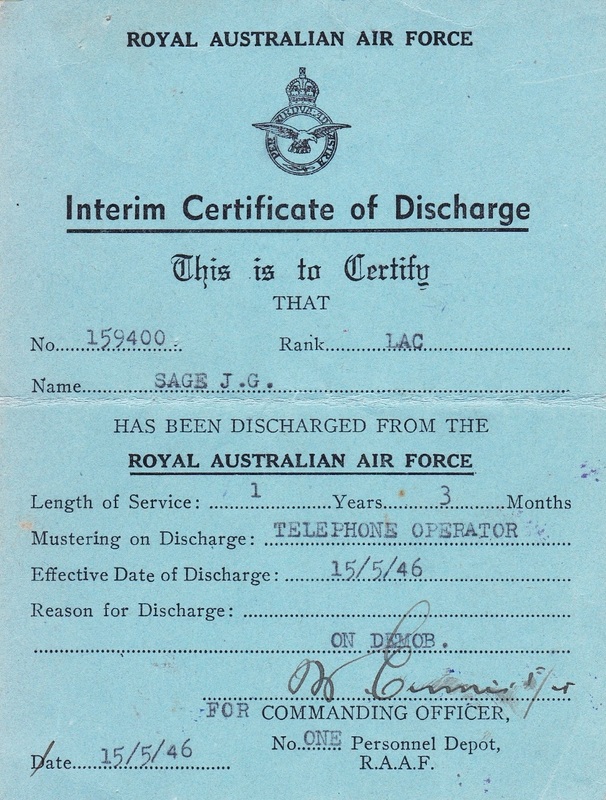 An Interim Certificate of Discharge to 159400 Sage J G. John Gerald Sage enlisted on 14 Feb 1945 at Melbourne and discharged on 15 May 1946 from East Sale with the rank of Leading Aircraftman. 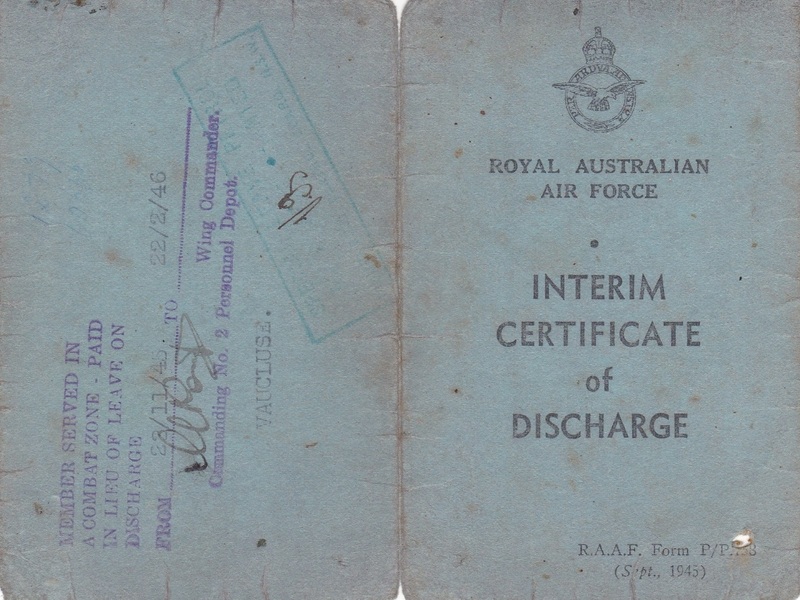 D899. 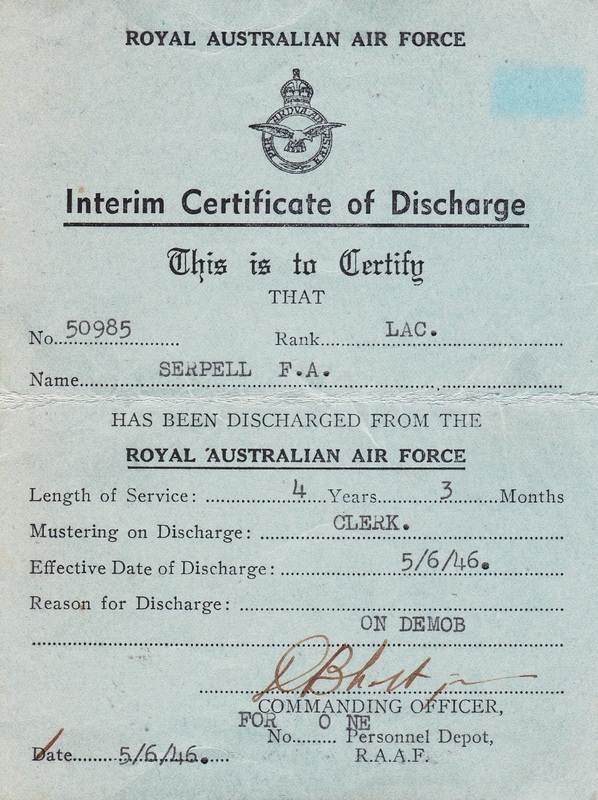 An Interim Certificate of Discharge to 50985 Serpell F A. Frank Absolem Serpell enlisted on 23 Feb 1942 at Melbourne and discharged on 5 Jun 1946 from Air Force Headquarters Records with the rank of Leading Aircraftman. D1003. 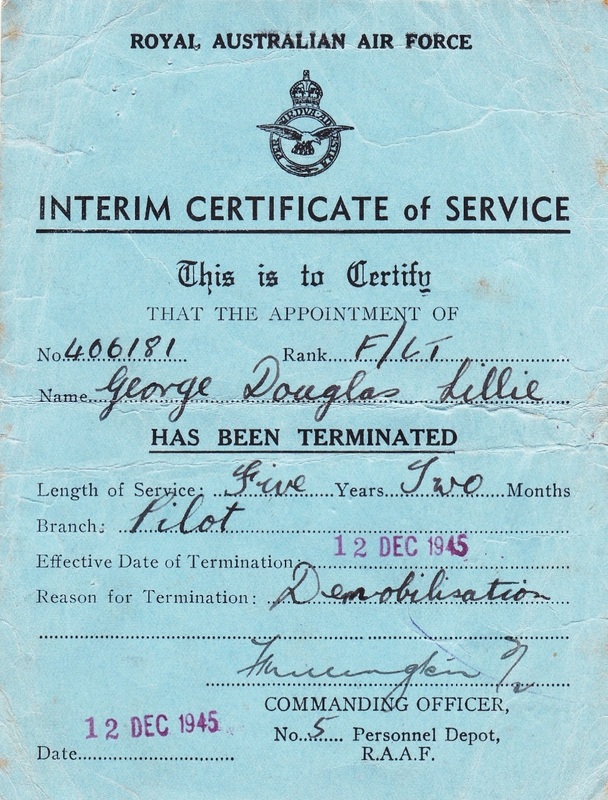 An Interim Certificate of Discharge to 406181 Lillie G D. George Douglas Lillie enlisted on 12 Sep 1940 at Perth and discharged on 12 Dec 1945 from 4 Communications Unit with the rank of Flight Lieutenant. 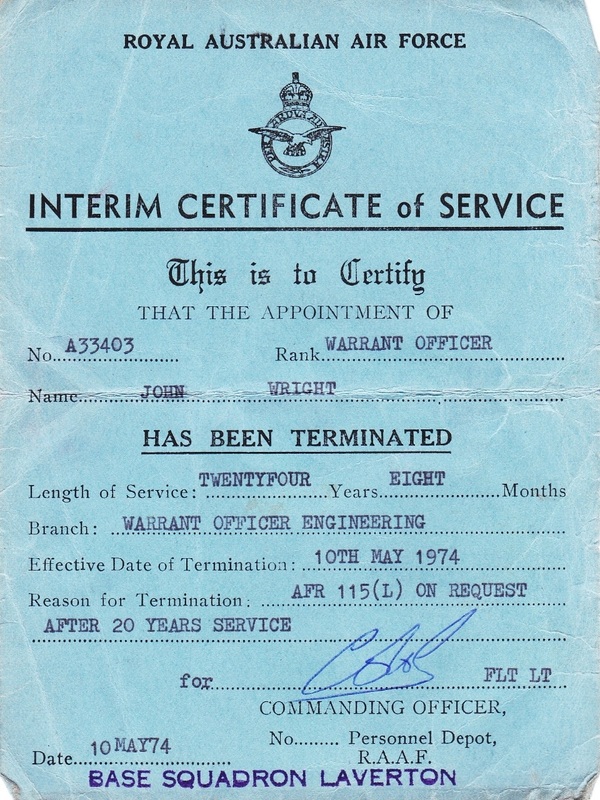 D1022. 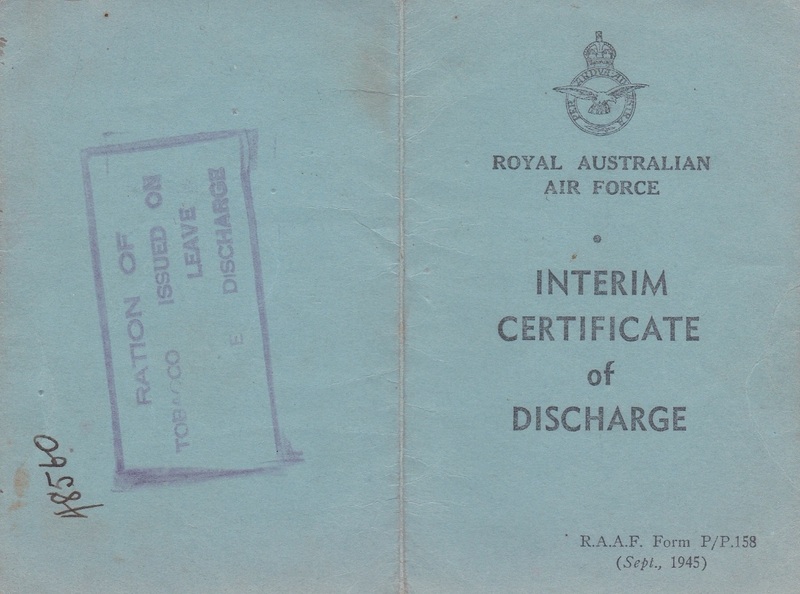 An Interim Certificate of Discharge to Richard Leslie Walter Scott. 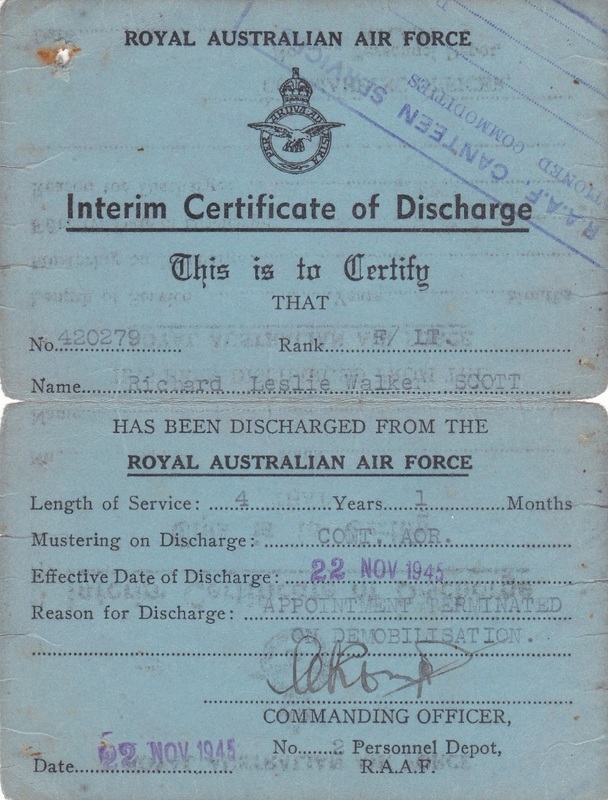 Richard enlisted on 11 Oct 1941 at Sydney and discharged on 22 Nov 1945 from Air Force Headquarters with the rank of Flight Lieutenant. 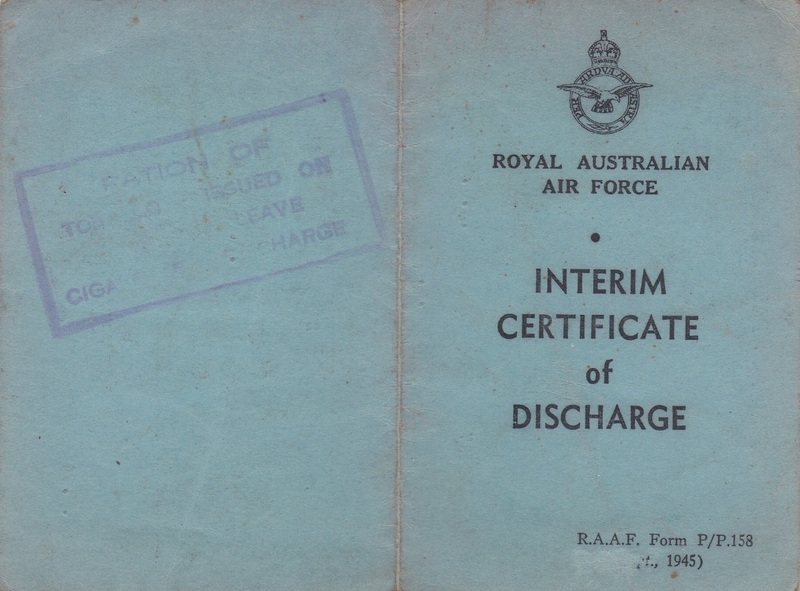 D1186. 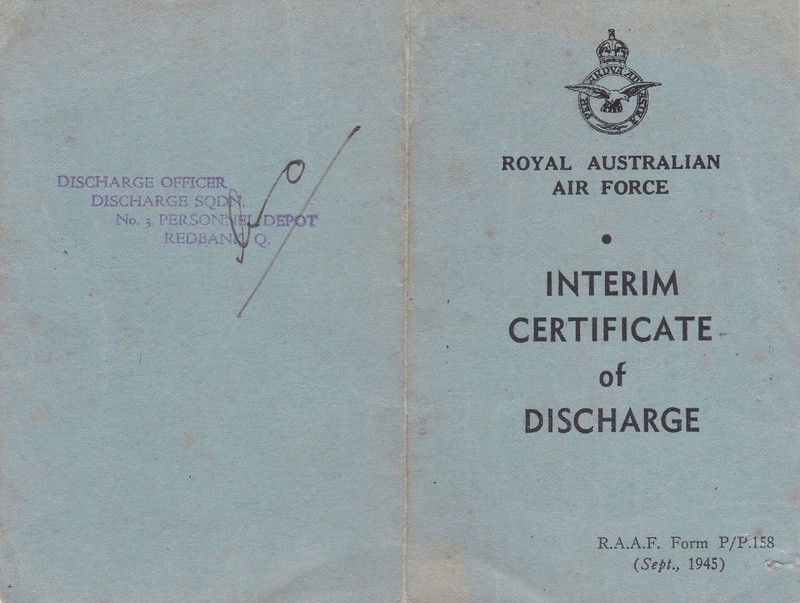 An Interim Certificate of Discharge to 143437 Brown R F. Robert Brown enlisted on 21 Jul 1943 at Melbourne and discharged on 8 Jul 1946 from No 2 Air Observer School with the rank of Leading Aircraftman. D1204. 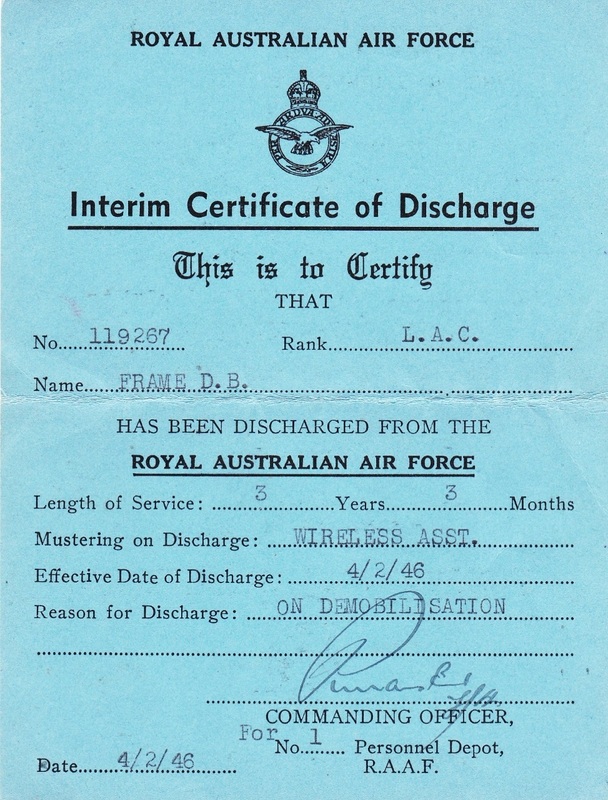 An Interim Certificate of Discharge to 119267 Frame D. B. Douglas Bruce Frame enlisted on 6 Oct 1942 at Melbourne and discharged on 4 Feb 1946 from 1 Engineering School (STAFF) with the rank of Leading Aircraftman. 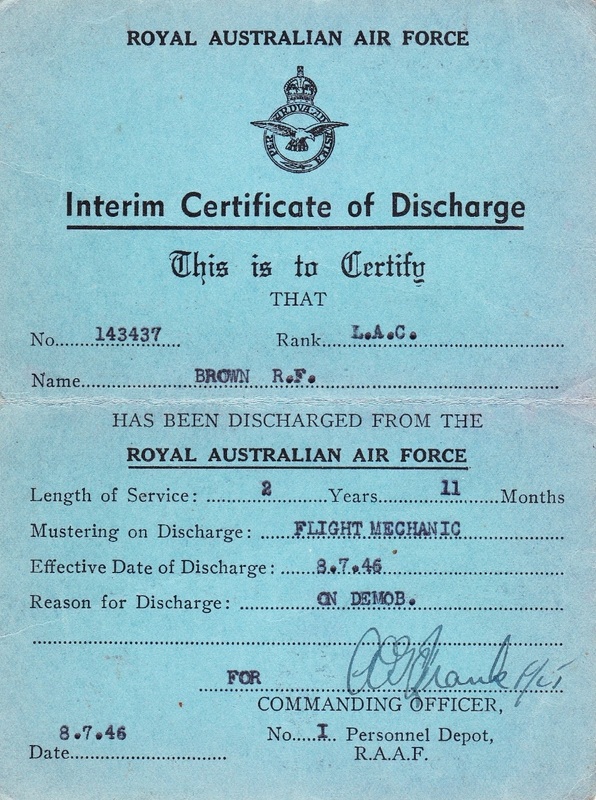 D1245. 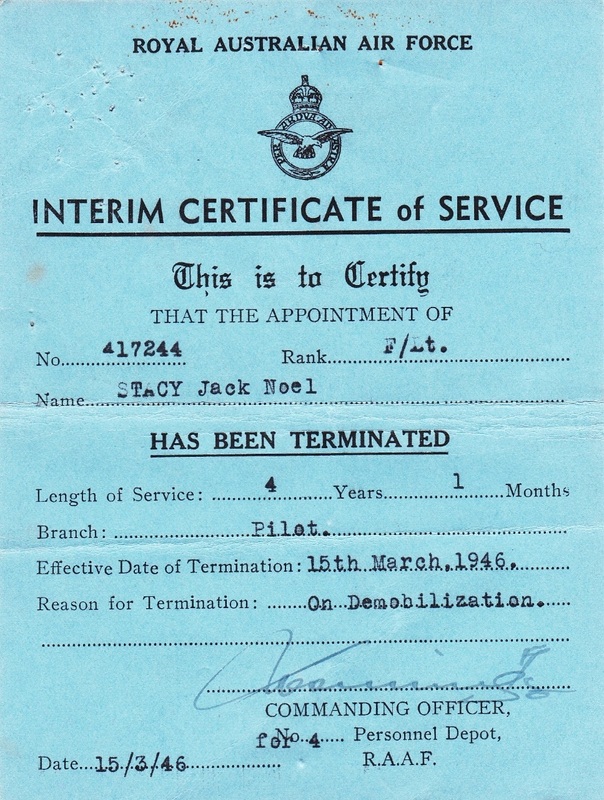 An Interim Certificate of Service to 417244 Stacy J. N. Jack Noel Stacy enlisted on 31 Jan 1942 at Adelaide and discharged on 15 Mar 1946 from 35 Squadron with the rank of Flight Lieutenant. 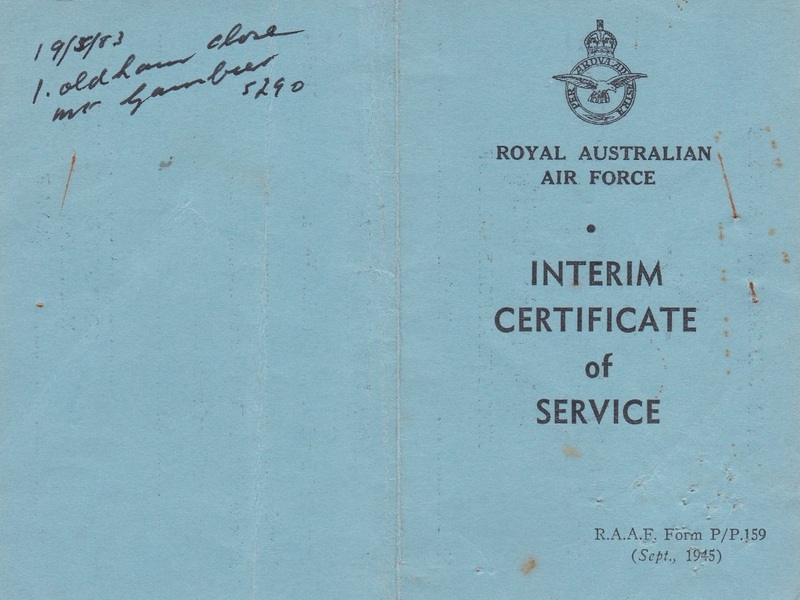 D1250. 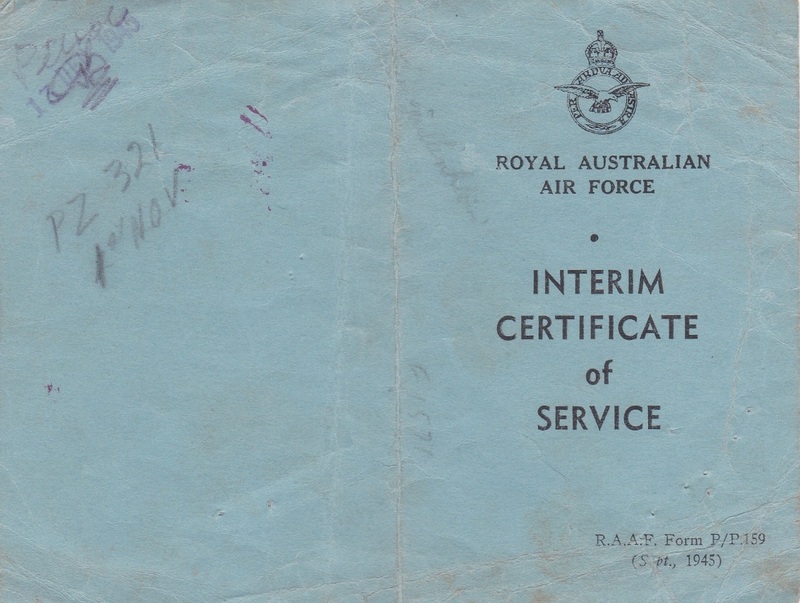 An Interim Certificate of Service to A33403 John Wright. 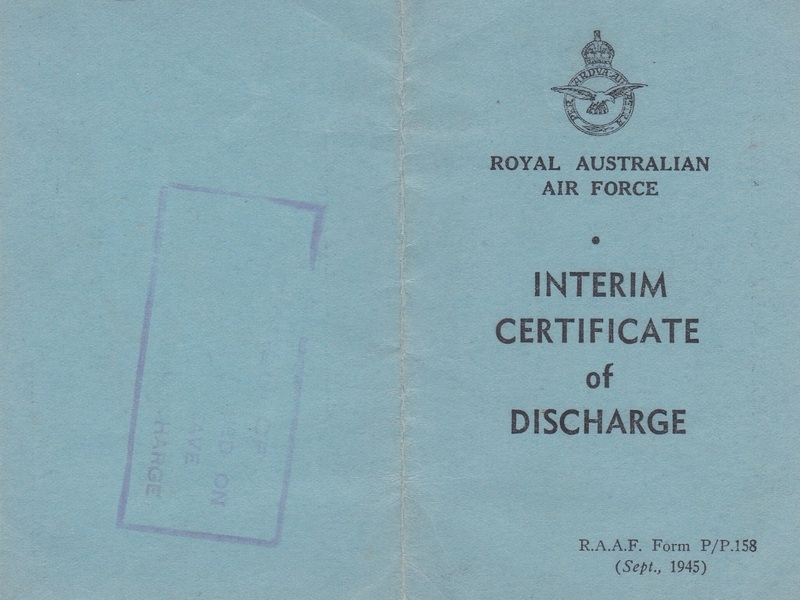 John Wright discharged on 10 May 1974 from Base Squadron Laverton as a Warrant Officer Engineering. D1264. 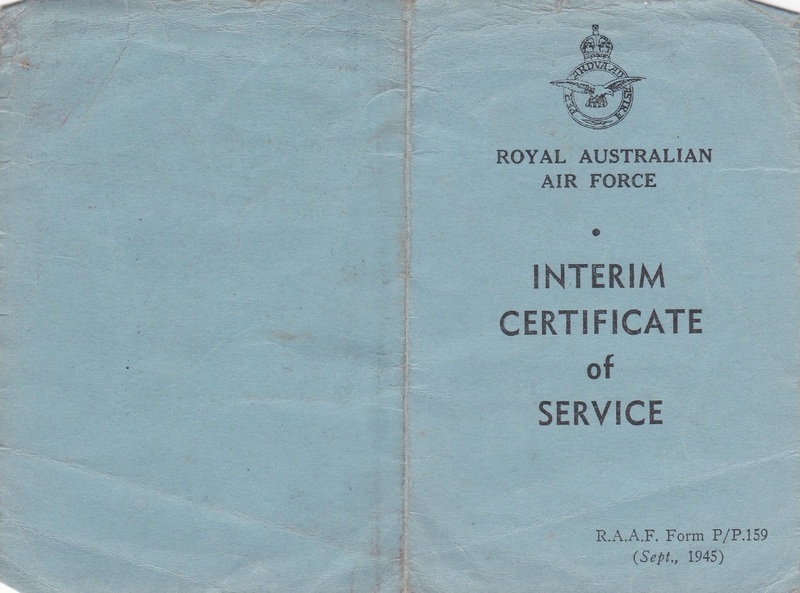 An Interim Certificate of Service to 73257 Steigrad Seeyon. 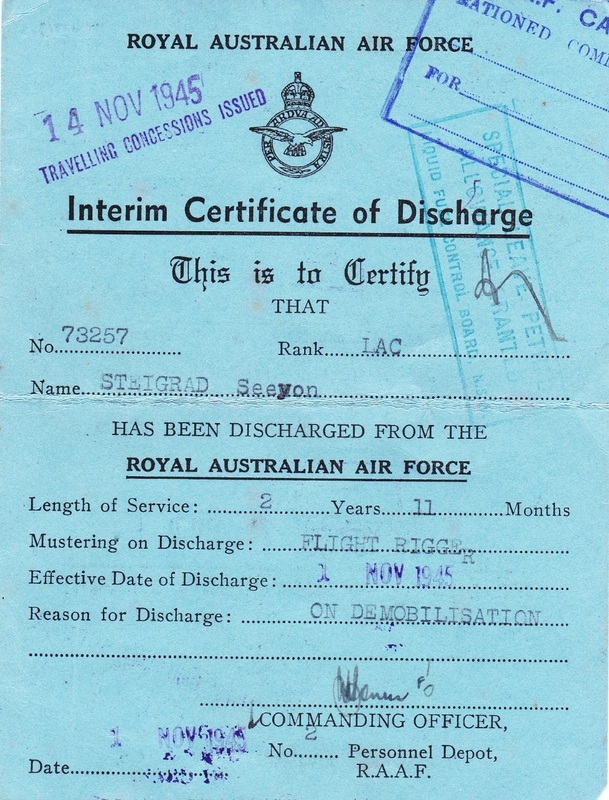 Seeyon Steigrad enlisted on 24 Nov 1942 at Sydney and discharged on 1 Nov 1945 from 87 Squadron with the rank of Leading Aircraftman. D1266. 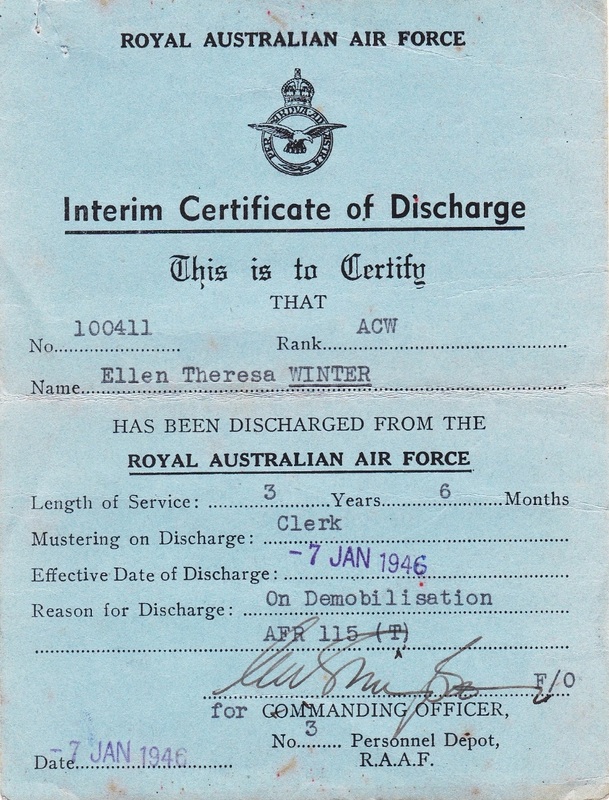 An Interim Certificate of Discharge to 100411 Ellen Theresa Winter. 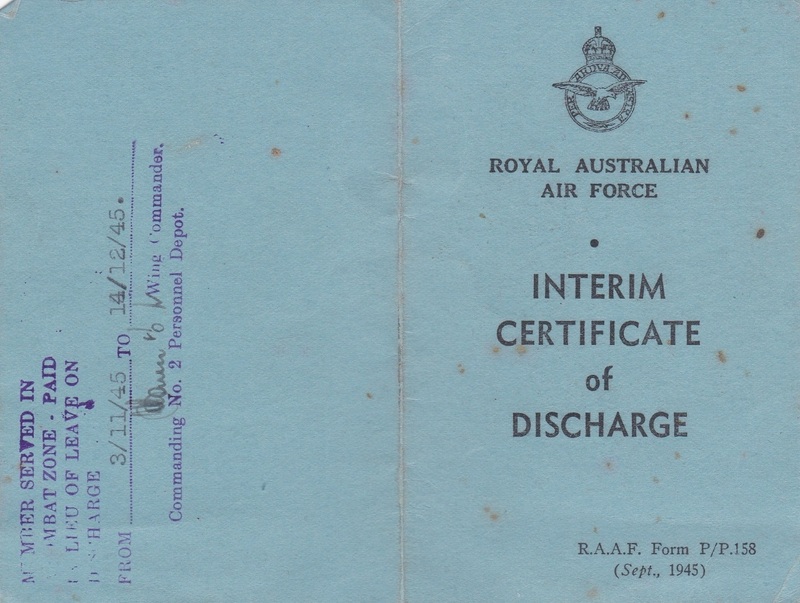 Ellen enlisted on 2 Jul 1942 at Brisbane and discharged on 7 Jan 1946 from RAAF Command with the rank of Aircraftwoman.